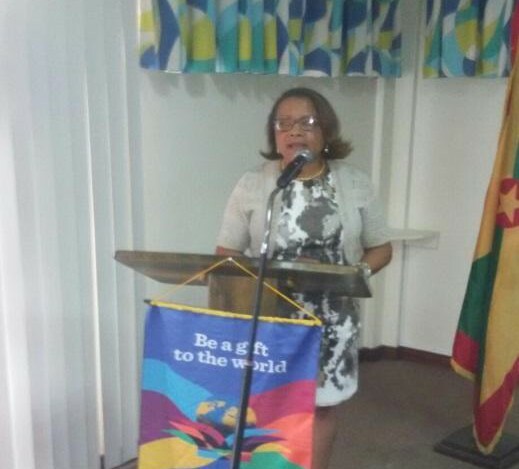 On Thursday, 12 May 2016, Dr Beverly Nelson, Chairperson of The Children’s Health Organization Relief and Educational Services (CHORES), received a cheque of EC$3,438.50 from The Rotary Club of Grenada to assist with the CHORES Support Group (Grenada), Spring 2016 Clinic held 25 to 29 April 2016. Dr Nelson, while addressing the membership, thanked and expressed gratitude to the Club in support of the project. She indicated that it was not feasible to host this year’s programme at the usual facility, which is currently undergoing construction. They felt very comfortable at this year’s venue — the medical suite at the National Athletics Stadium; where it was a very rewarding experience, as the CHORES Team completed an amazing record-breaking week. The cardiology team evaluated 107 patients with 83 echoes performed; and an additional 235 patients received care in physio, speech and occupational therapy. Based in Jacksonville, Florida, CHORES is a not-for-profit, health organization, founded in 1987 to assist in the development of health-related services in cardiology, dental care, biomedical engineering, nursing education, and special needs services. In 1993, a CHORES support group was formed in Grenada to coordinate the activities for the Grenada chapter. Through CHORES, medical professionals have been able to volunteer their time and expertise in pediatric care for the improvement in the quality of life for children. Rotary is an international, non-profit service organization, with 1.2 million Rotarians, who make up more than 34,000 Rotary clubs in nearly every country in the world and share a dedication to the ideal of ‘Service Above Self’. Members volunteer in communities, at home and abroad to support Rotary’s 6 areas of focus: peace and conflict prevention/resolution; disease prevention and treatment; water and sanitation; maternal and child health; basic education & literacy; and economic and community development.